It’s pumpkin season, alright! I’ve got four large gourds sitting on my front stoop, and a variety of smaller pumpkins all around the house. I’m also thinking about all the lovely things we can make with pumpkin. 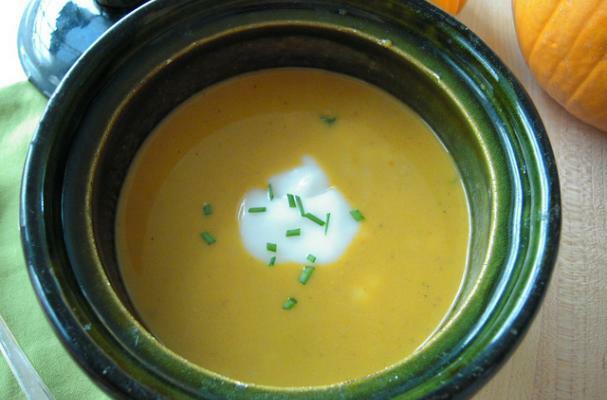 The following recipe is a hearty allergy-friendly gluten-free take on pumpkin soup. I’ve added sunflower seed butter for extra protein, making it more of a complete meal than just the starter that soup usually gets billed as. The cool coconut milk yogurt is the perfect finish to this lovely rich orange soup, and chives or green onions seal the deal.